Java DataInputStream class allows an application to read primitive data from the input stream in a machine-independent way. Java application generally uses the data output stream to write data that can later be read by a data input stream. 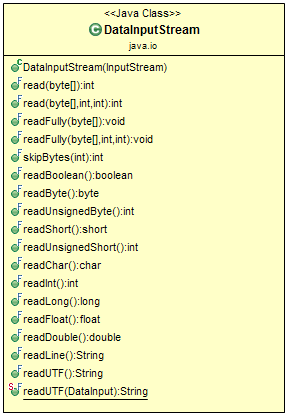 DataInputStream(InputStream in) - Creates a DataInputStream that uses the specified underlying InputStream. int read(byte b) - Reads some number of bytes from the contained input stream and stores them into the buffer array b.
int read(byte b, int off, int len) - Reads up to len bytes of data from the contained input stream into an array of bytes. boolean readBoolean() - See the general contract of the readBoolean method of DataInput. byte readByte() - See the general contract of the readByte method of DataInput. char readChar() - See the general contract of the readChar method of DataInput. double readDouble() - See the general contract of the readDouble method of DataInput. float readFloat() - See the general contract of the readFloat method of DataInput. void readFully(byte b) - See the general contract of the readFully method of DataInput. void readFully(byte b, int off, int len) - See the general contract of the readFully method of DataInput. 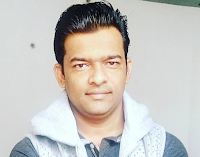 int readInt() - See the general contract of the readInt method of DataInput. long readLong() - See the general contract of the readLong method of DataInput. short readShort() - See the general contract of the readShort method of DataInput. int readUnsignedByte() - See the general contract of the readUnsignedByte method of DataInput. int readUnsignedShort() - See the general contract of the readUnsignedShort method of DataInput. String readUTF() - See the general contract of the readUTF method of DataInput. static String readUTF(DataInput in) - Reads from the stream in a representation of a Unicode character string encoded in modified UTF-8 format; this string of characters is then returned as a String. int skipBytes(int n) - See the general contract of the skipBytes method of DataInput. A program to read each primitive char type from file sample.txt.